Tonight's episode of Monday Night Raw was all about major announcements regarding WrestleMania 35 and the one which saw WWE Hall of Famer Kurt Angle making a major announcement regarding his future in the Professional Wrestling history. The night kicked off with The Shield announcing their farewell, then Finn Balor lost the Intercontinental Title to Bobby Lashley, Alexa Bliss announcing the host of WrestleMania 35, and finally, a WrestleMania match between Triple H and Batista was verbally agreed as well. 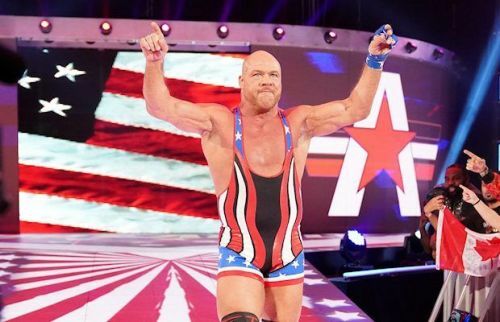 However, that wasn't the end of the major announcements, as Kurt Angle came out to a huge reception from his hometown crowd in Pittsburgh and announced that he will indeed be wrestling his final match at the upcoming WrestleMania 35 event, deciding to call it a career which started way back in 2002. Throughout Angle's career, the Olympic Gold Medalist has faced off against some of the toughest superstars in the world of Pro Wrestling and if WWE hopes for Angle to go out in a proper way, then the company's creative team needs to make sure that the Hall of Famer is booked in a right way, against the right opponent at 'Mania 35. Therefore, in this article, we'll take a look at 5 superstars who could possibly step up to challenge Kurt Angle in his final match at WrestleMania 35. Will The Scottish Psychopath bring an end to Angle's career? Sure, both Kurt Angle and Drew McIntyre have wrestled each other in the past and matter of fact is, there was rather a passing of the torch moment between the two men during their recent encounter on Raw when McIntyre made sure Angle had tapped out to his own Ankle Lock submission maneuver. On this occasion though, McIntyre could very well step up to the plate once again and challenge Angle to yet another match, this time at WrestleMania 35. Given that McIntyre for once doesn't have a proper storyline leading up to WrestleMania, this could be the opportunity he needs to shine on the big stage.